My name is Jonny Webb and I am a robot. Last summer, my heart stopped for three and a half minutes. This book makes you cry within the first couple of chapters! Seriously, it should come with a warning...and tissues. I was prepared for an emotional journey but I didn't expect to have my heart ripped out and pummelled through out. Talk about making your characters suffer! This is the first book I've read by Tamsyn Murray and it definitely won't be the last. Her writing style is so beautiful and absorbing. She has a knack of entwining you into the lives of the characters, so that you are completely vested in their future and willing everything to turn out right. The story is told from two view points. Firstly we have Jonny who is barely surviving in hospital while he waits for a heart transplant. He has nearly given up hope of it ever happening, until the hospital gets a call. Then we have Niamh, who hates her twin brother with a passion, until she realises what life without him is like. I will let you work out the Maths out on this one. I adored Niamh and Jonny, even though they wore their flaws like badges of honour. Niamh isn't the easiest person to get along with, now with added overwhelming grief, she is more prickly than usual, but you can't help but love her. And Jonny, well let's just say, he gets a little too cocky with his new heart. But this is a time when they both have to grow up very quickly. They are pushed into life changing situations that neither of them are quite ready for. It's like someone clicks their fingers and instantly two teenagers have to deal with adult situations. So you are rooting for them. You are waving your flag as high and as fast as you can, to show your support. Em literally broke my heart. What an amazing character, who might only be a small part of the story but she shines brightly through out the book. 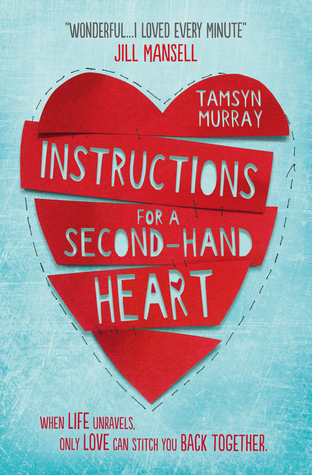 It quite obvious without reading the added information at the back of the book, that Tamsyn Murray did a lot of research on heart surgery because she talks about it in great detail. This book is unputdownable. It's so gripping and realistic. I wouldn't be surprised if this book gets optioned for a film. It's that good! And definitely an award winning future. If you're a John Green and/or Jandy Nelson fan, you will love this.